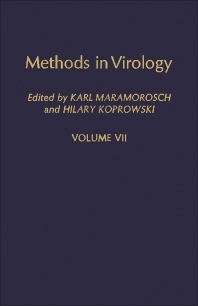 Methods in Virology, Volume VII focuses on the methods used in virology, including radioimmunoassays, microscopy, hybridization, and mutagenesis. The selection first elaborates on monoclonal antibody techniques applied to viruses; competition radioimmunoassays for characterization of antibody reactions to viral antigens; and enzyme immunosorbent assays in plant virology. Discussions focus on the principles of enzyme immunosorbent assay, choice of enzyme and preparation of conjugate, determination of immunoglobulin class, and maintenance and specificity testing of hybridomas. The text then elaborates on electron microscopy for the identification of plant viruses in in vitro preparations and cloning and expression of viral antigens in Escherichia coli and other microorganisms, including influenza virus, expression of foreign coding sequences in Escherichia coli, hepatitis B virus, electron microscope, immunoelectron microscopy, and imaging of nucleic acids. The manuscript takes a look at the detection and characterization of subgenomic RNA in plant viruses; exploring the gene organization of baculoviruses; and spot hybridization for detection of viroids and viruses. Topics include application to viral diseases, mapping mutuations of baculoviruses, transcriptional mapping of baculovirus genomes, and genetic mapping by blot hybridization. The selection is a valuable source of information for researchers interested in the methods employed in virology.